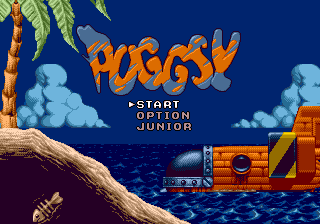 Puggsy is a platform game developed by Traveller's Tales and published by Psygnosis in 1993 for the Sega Mega Drive, Sega Mega-CD and Commodore Amiga computers. In the US, the Mega Drive and Mega-CD versions were released on the first day of Winter CES 1994; January 6th. The game was notable at the time of release for having an unusual physics system, in which Puggsy can use various objects for aiding him in battle, to helping him solve puzzles to proceed. The game follows the character, Puggsy, an orange alien which has been marooned on an alien planet and got his spaceship stolen by its inhabitants. Now he ventures into the island, searching for the whereabouts of his spaceship. Use the D-Pad to move around. The button jumps; while in mid-air, you can press down to stomp on enemies. To pick up an item, press ;to drop it, press again, also, holding up or any diagonally upward direction then pressing will throw the item upwards. is used to interact with the item Puggsy is holding (e.g. while holding a shield, press to gain invincibility). The Puggsy character originally came from a Commodore Amiga demo named "Puggs in Space", which proved to be so successful that an entire game was made out of it. A Super NES version of the game was planned, but cancelled, and sequels were supposedly in the works before being axed too. The Mega-CD version offers new levels and boss fights, an improved soundtrack and full motion video cutscenes. There are various hidden cheats if you can find the place to carry them out.